I finished a fantastic novel this past week, "Playing for Keeps" by Mur Lafferty. This novel speaks to anyone who ever dreamed of being a superhero.... and what that may actually have meant. The book focuses around Keepsie Branson and her friends who have superpowers, yet were turned down by the superhero academy. As one might expect, their little band of Third Wavers get caught in the middle of a big huge battle between the heroes and the villains. Even if you have never dreamed of becoming a superhero (and who hasn't) you will probably relate (as I did) to the feeling of believing you are special, then being told you are not. I read the book in print form. The book is well written reads quickly. There were times when I had to force myself to put the book down. Mur is releasing the book as a podcast both here and here as well as a downloadable pdf. The novel even has its own theme song. (I haven't been able to listen to the podcast due to issues with syncing my iPod since I got back from China, but I have been assured it is fantastic) Please check it out and tell a friend... or a stranger. So, there have been a lot of reviews and opinions being posted out there on the webs regarding the movie Cloverfield. Since I saw it last weekend, and added my voice to a podcast review posted on the ADDcast, I shall also include a review here. I will warn you that the ADDcast review is full of spoilers. My comments here attempt to be spoiler-free. That said, there are some disclaimers. The movie did make me nauseous with the perpetual shaky-cam. At one point I was afraid the movie was going to give me a migraine. Because of this, there were many points when I had to close my eyes or look away from the movie screen. Thus, my recommendation is to either sit in the back of the theater, or wait for the DVD to watch it on the small screen. The small screen provides additional benefit, there are lots of small details that are easy to miss because there is so much going on and in many parts, the action moves too fast. If you wait for the DVD, you can pause and re-wind. Beyond that, this is a different breed of monster movie. There is a monster in the movie, but that is not what the movie is about. It is about how humans, relationships, and how people react in the face of disaster. Some of the characters are a bit annoying at times, but that is the way of the world. The movie, in my un-informed opinion, does a decent job of showing how different people’s coping with a situation beyond comprehension. To summarize, I look forward to watching the movie again, probably more than once... but only on the small screen. Of my friends, the reaction is mixed - some love it, some hate it. My humble opinion is positive, but with a sea-sickness warning. My ISU SSP 2007 presentation is complete. The results will forever be found at this url. Perhaps someday the video will be included in the lunar archive. I think it went pretty well, I've been getting a lot of praise, but of course, I felt that I could have, "um" done better. Thanks to everyone who sent me well wishes, good thoughts, and vibes. My sweet husband even left work to come see it live. Thanks to all who watched the live webcast or have already seen the archive. Science fiction and horror writer Matt Wallace, posted a very cool blog post about the talk. Coincidentally the ISU president, Mike Simpson, was in the area for a meeting. So, after my talk, I had the great pleasure of spending the evening with fellow ISU alumni. Overall, it was a good day, although my feet hurt by the time I got home. Please watch my presentation, and if you have any questions, feel free to ask them in the comments field of this post. I've been nervous about publicizing this, but I don't think I can avoid it any longer. On Tuesday, January 15, I will be giving a presentation at STScI in the Bahcall Auditorium. The talk is International Space University, Beijing 2007: Explanation, Experiences, and Project Phoenix. The talk should run about 1 1/2 hours with time at the end for questions. Everything will be web-cast and available online after the talk. I hope you enjoy the talk. Let me know what you think. International Space University, Beijing 2007: Explanation, Experiences, and Project Phoenix. 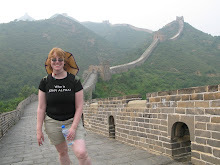 During the summer of 2007, Laura spent her summer at the International Space University Summer Session Program in Beijing, China. In this seminar Laura will discuss the origins of ISU, why it was held in China, her team project, and her experiences with the culture. Her team project, “Project Phoenix: Lunar Biological and Social Archive”, addresses the idea of having a backup repository of human knowledge stored on the moon.